William Horn Battle was born on October 10, 1802 in Edgecombe County, NC, the son of Joel Battle and Mary Palmer (Johnston) Battle. He entered the sophomore class of The University of North Carolina and graduated second in his class two years later, in 1820. He then studied law for three years at Williamsborough in the office of Leonard Henderson, later Chief Justice of the NC Supreme Court. He was admitted to the North Carolina bar in 1824. On May 18, 1825, William Horn Battle married Lucy Martin Plummer, daughter of Kemp Plummer and Susanna (Martin) Plummer of Warrenton, NC; they had ten known children, two of whom died in infancy. Also in 1825, William Horn Battle launched his own law practice in Louisburg, county seat of Franklin County. From 1834 to 1839, William Horn Battle and Thomas P. Devereaux served as reporters to the NC Supreme Court. Upon Devereaux's resignation in 1839, he was made sole reporter and moved his residence from Louisburg to Raleigh. 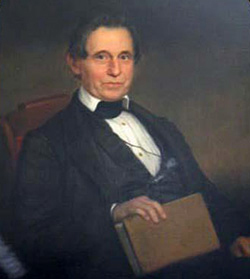 In 1840, William Horn Battle was elected as a Judge on the NC Superior Court. In 1843, William Horn Battle moved his family to Chapel Hill so his sons could attend the University of North Carolina. In 1845, William Horn Battle was a Professor of Law at the University of North Carolina, a position he retained until 1868. In 1848, William Horn Battle was appointed by Governor William Alexander Graham as an Associate Justice on the NC Supreme Court to replace Associate Justice Joseph John Daniel, who had recently died, but the NC Legislature did not confirm the appointment, so he had to resign when they elected Ricmond M. Pearson in his stead. He was then re-elected as a Judge on the NC Superior Court. In 1852, William Horn Battle was elected as an Associate Justice on the NC Supreme Court, replacing Chief Justice Thomas Ruffin, who had retired, and he served until he was removed by Federal forces in March of 1867 as part of the Reconstruction Act. In 1868, William Horn Battle moved his family again, this time to Raleigh, NC, where he established a law partnership with his two sons. The 79th NC General Assembly (1870-1872) appointed William Horn Battle as the sole commissioner to revise the North Carolina statutes, and the 80th NC General Assembly (1872-1874) authorized their publication. William Horn Battle then served as President of the Raleigh National Bank for several years. His wife died in 1874, and in 1876 he returned to Chapel Hill with his son Kemp, who had been elected President of the reopened University of North Carolina. He again served as Professor of Law at the University of North Carolina until his death at Chapel Hill on March 4, 1879. William Horn Battle was buried in the Oakwood Cemetery in Raleigh, NC. William Horn Battle (1802-1879) was a North Carolina jurist and law professor who served on the North Carolina Supreme Court. He was the father of Kemp P. Battle. Battle was born in Edgecombe County, North Carolina and educated at the University of North Carolina at Chapel Hill. He became a lawyer, court reporter for the NC Supreme Court, a member of the North Carolina House of Commons, and a NC Superior Court Judge. He also taught at the University of North Carolina School of Law. Battle was appointed to serve on the Supreme Court by Governor William Alexander Graham in 1848 until the legislature could meet to select a replacement for Judge Joseph J. Daniel. The legislators did not elect Battle to continue in office at this time, but they chose him to fill a seat on the court in 1852. He served until 1868, when he returned to the practice of law. Battle later served as president of a bank and as Dean of the UNC Law School, while his son served as president of the university. William H. Battle was born in Edgecombe County, NC in October of 1802, the grandson of Elisha Battle, a prominent member of the Baptist church in North Carolina. He was the oldest of six brothers, all of whom were educated at the University. In 1833 and 1834, he was a member of the House of Commons from Franklin County and, together with ex-Governor James Iredell and future-Justice Frederick Nash, was a member of the commission which compiled the Revised Statutes. He was appointed Reporter of the Supreme Court in 1839. In 1843, he removed to Chapel Hill, and in 1845 he was elected by the trustees of the University professor of law and conducted the Law School until 1866. Among his students were three of his successors on the Supreme Bench - Davis, Shepherd, and Clark. In May of 1848, on the death of Justice Joseph J. Daniel, he was appointed by Governor William A. Graham to fill the vacancy till the Legislature met, which elected Richmond M. Pearson instead. In 1852, upon the resignation of Chief Justice Thomas Ruffin, Judge Frederick Nash became Chief Justice, and Battle was again elected to the Supreme Court by an almost unanimous vote, irrespective of party. He filled the position until 1865 when all the State officers were declared vacant by the Union Army. He was then again elected to the Supreme Court and filled the post until all positions were again vacated by the new State Constitution in 1868, when he returned to the practice of law. In 1876, he was chosen president of the Raleigh National Bank. In 1877, his son, Kemp P. Battle, haveing been elected President of the University, Judge Battle returned to Chapel Hill as Dean of the Law School. He published a Digest of the North Carolina Report in four volumes, and edited the compilation of laws known as Battle's Revisal. He died in March of 1879, in the 77th year of his age.